The Tag Heuer Formula 1 Watch WAH1215.BA0861 twinkles with its one hundred and twenty diamonds around the bezel adding up to 0.75 carat. 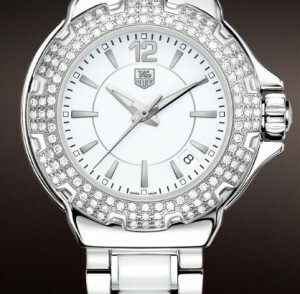 It is one of Tag Heuer’s beautiful and functional women’s watches. 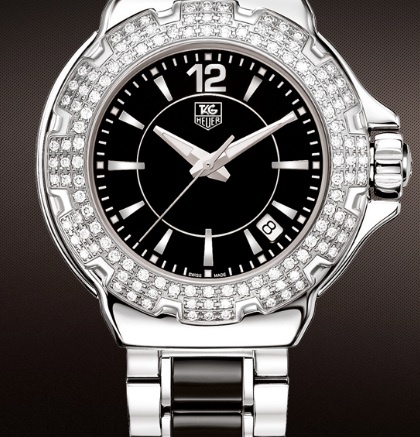 The other Tag Heuer Formula 1 model with 120 diamonds (WAH1214.BA0859) differs only in its black face and ceramic bracelet. This creates a stark contrast among the elements in the watch that is absent in the unified white model. The ceramic element in particular, with the black ceramic within the stainless steel of the bracelet, stands out and highlights the use of multiple materials in a way the white doesn’t by blending largely unnoticeably. There is also a very similar Formula 1model (CAC1310.BA-852) with 120 diamonds around the bezel but that also features diamonds on the hour markers and the bracelet is all stainless steel. Its heightened fashion is matched by its additional functions on the face with three chronographs. Tag Heuer initially created chronographs for automobiles and aircrafts and moved into sports timing. The current Formula 1 watch line’s name is clearly inspired by the brand’s history with Formula One racing. Tag Heuer isn’t a brand solely devoted to sports watches, with timepieces created for and worn by Hollywood stars. The Tag Heuer Formula 1 Watch WAH1215.BA0861 combines this history of sports functionality and Swiss precision with an effort towards fashion and jewelry. The Tag Heuer Formula 1 Watch WAH1215.BA0861 is a beautiful piece women’s jewelry that catches the eye with over 100 diamonds and yet is also able to provide accurate time even to extreme depths in water. It comes at a high price, but the combination of quality and materials with style may make it worth it for you.